After Khashoggi, How Safe Are African Critics of Saudi Arabia? Will Saudi Journalist Khashoggi's Killing Sink African Projects? 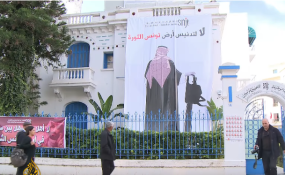 Video screenshot of a poster hung on the office building of the Tunisian Journalists' Syndicate depicting Saudi Prince Mohammed bin Salman holding a chainsaw with the phrase 'no to the desecration of Tunisia, land of the revolution'. Cape Town — Crowds protesting a planned visit by Saudi Crown Prince Mohammed bin Salman (MBS) have gathered in the capital's main avenue, Al Jazeera reports. The monarch's arrival forms part of a regional tour and comes ahead of the G20 summit set to take place in Argentina. According to AFP, an open letter by the Tunisian Journalists' Syndicate called MBS's arrival a 'flagrant violation of the principles of our revolution' - Tunisian citizens gained freedom of speech and the press following the 2011 overthrow of Zine el-Abidine Ben Ali. MBS's trip to the country is his first overseas journey since the killing of Jamal Khashoggi, a Saudi Arabian columnist and dissident whose death is suspected to have been orchestrated by the 33-year-old crown prince, Al Jazeera writes. Journalists and activists demonstrating against the royal's arrival hung a banner over the Tunisian Journalists' Syndicate's headquarters depicting MBS holding a chainsaw, an apparent illusion to the dismemberment of Khashoggi's body, Bloomberg reports. The poster included the phrase: 'No to the desecration of Tunisia, land of the revolution'. Copyright © 2018 allAfrica.com. All rights reserved. Distributed by AllAfrica Global Media (allAfrica.com). To contact the copyright holder directly for corrections — or for permission to republish or make other authorized use of this material, click here.